It’s time to publish the statistics derived from the Cyber Attacks Timelines of May (Part I and Part II). Let’s start saying that this month I have recorded a larger number of events than April: 116 vs 99, equivalent to a 18% increase. 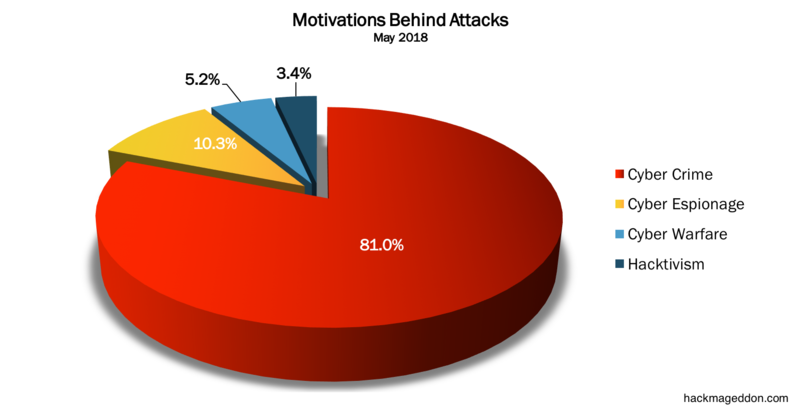 The Daily Trend of Attacks chart shows a peak in the middle of the month and a slightly decreasing activity in the last two weeks. Cyber Crime confirms its first position in the Motivations Behind Attacks, with practically the same percentage of April (81% vs 80.8%). Cyber Espionage is equally stable with 10.3% (against 11.1% in April), followed by Cyber Warfare (5.2% vs 3% in April), and Hacktivism (3.4% vs 5.1% in April). Once again, malware is stable on top of the Attack Vectors chart with 31.9% (it was 27.3% in April). And once again, account Hijackings are also stable at number two with 21.6% (it was 17.2% in April). And… Once again, targeted attacks get the third place with 12.9% (it was 12.1% in April). Industries and single individuals lead the Distribution of Targets chart with 18.1 (they were respectively 18.2% and 25.3%). Public administration, defence and social security rank at number three with 10.3% from 15.2%.